Why would I need self storage in Greenville, SC? There are a variety of reasons why you might need self-storage in Greenville, SC. How much is a storage unit in Greenville, SC? The cheapest storage unit in Greenville, SC is $27.00 per month. What size storage units do you have available in Greenville, SC? In Greenville, SC we have sizes that range from 5'x5' to 20'x30' to suit your storage needs. How much is it for a 5'x5' storage unit in Greenville, SC? The cheapest 5'x5' storage unit in Greenville, SC is $42.00 per month. Greenville is a vibrant city in northwestern South Carolina, located 100 miles northwest of Columbia, 150 miles northeast of Atlanta and 200 miles northwest of Charleston. It's among the fastest-growing cities in the state, quickly joining the ranks of the largest urban areas in South Carolina. Greenville's strong job market has earned it national attention, and it has been named one of the best U.S. cities for young professionals by Forbes magazine. Cherokee Indians were the first inhabitants of the area now called Greenville. In the 1760s, Richard Pearis became the first European-American settler to arrive in the region. He built a gristmill and trading post near Reedy River Falls, kick-starting development in the region. Significant population and infrastructure growth occurred from the mid- to late-1800s, and by 1900, Greenville had several cotton mills, a few educational institutions and a pair of railroads. The city's economy flourished after the World Wars, experiencing major growth in its commercial and residential developments. Greenville and its close neighbor, Spartanburg, make up a metropolitan region with a population of more than 1 million people. The city has received recognition for its revitalization efforts, which have breathed new life into the downtown region while maintaining its historical integrity. This urban area has numerous attractions to enjoy, including the Greenville County Museum of Art, the Museum of Confederate History, Roper Mountain Science Center, Greenville Little Theatre and Greenville Zoo. 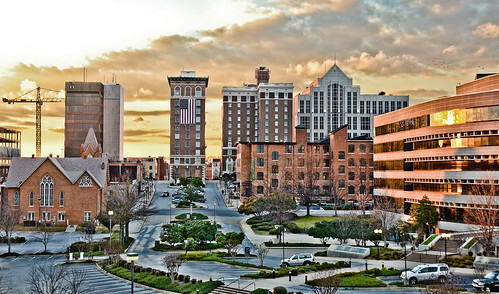 Greenville also offers a strong economy and a thriving job market. Its unemployment rate is significantly lower than the national average, and job opportunities in the city are continuing to increase. The local economy is diverse, with various industry sectors including biotechnology, engineering and specialty manufacturing. Lockheed, General Electric and IBM are just some of the high-profile organizations that call Greenville home. These and other local businesses benefit from Greenville's low taxes, market accessibility, and large, high-quality workforce. Greenville's population is one of the most educated in the nation, which has been a major draw for businesses and a benefit to the local economy. Greenville County Schools oversees public schools in Greenville. The district offers specialized studies in a variety of topics, including languages, communications arts, science and mathematics. You'll also find many private schools in Greenville, such as special education schools, parochial campuses and college-prep schools. Utilities: Major utilities companies in Greenville include Duke Energy, Blue Ridge Electric Co-op, Laurens Electric Co-op, Piedmont Natural Gas and Greenville Water. Garbage and Recycling: Greenville is divided into several collection zones, each assigned a regular pickup day for trash and recycling. You can determine your zone by visiting the city's website. Transportation: Transportation options in Greenville include bus, shuttle and a local bikesharing program. Greenville offers a wide variety of housing options close to the city center. Most of these homes are to the north and east of downtown Greenville, and include a mix of classical Tudor dwellings, bungalows, Charleston-style homes and town houses. Our lowest priced units in Greenville, SC average $46.38 per month. 327 people have reserved units in Greenville, SC in the past 30 days. There are 8 locations within Greenville, SC's city limits. There are 5 locations in Greenville, SC that offer AC and Heating features.